Welcome back to Champaign, the Pauls are still in the house. Quite literally, the House of Paign! Is this game on TV? Who knows…who cares??? We’re here to break down all of the action for you tonight, and we’re only slightly tired after the barnburner that was the Illinois football game. Patriotic crowd tonight, singing the national anthem with the band…also, a fun addition to the intros, it appears each Illinois player has their own avatar on the replay board. No, they aren’t amphibian-looking and blue. This is the first matchup in history between Boise State and Illinois, and only the fourth time the Broncos have ever played the Big Ten. They like to score points. Defense, though, is not their strong suit. I still think the Illini roll, but right now, BSU is hanging tough. On the plus side I’m getting really good at typing the word “State”. Right now, the Broncos are a little more athletic than I thought, and have some good speed in the game. Their cuts to the hoop are sharp, and with the number of open looks from 3 that they are getting, the picks and screens have been really, really nice. However, they are remarkably deficient on the defensive end, and really on the glass as well, with the Illini getting a number of good putbacks. Really nice oop-de-layup from McCamey to Dominique Keller. The pass was a little bit errant, but Keller used his long arms to corral the pass and lay it in. Yeah, he would start on so many other teams in Div 1. the 1980s Knicks, whoops I mean BSU, the uniforms tripped me up, my bad, are running up down with the Illini. This is a very troubling start here. I love how Boise St. has guys named Montreal, Noonan (miss it! MISS IT NOONAN) and a Zach Moritz! seriously where’s Belding and Spano. Now they’re playing Don’t Stop Believin. Where’s A.J. and Crede? 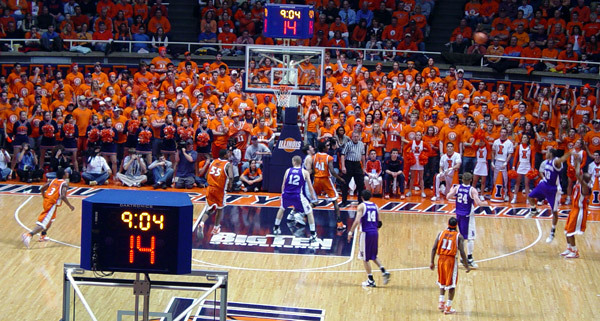 by the way McCamey sitting in foul trouble is hurting the Illini right now…still up by one, 37-36 3:43 till half. And I noticed there’s some dude named Anthony Thomas too. That’s funny, yet another Bears running back who had a great rookie season, and then did NOTHING. BTW, Doesn’t Brandon Paul sort of look like a young Kendall Gill? Mike Davis’s jumper has been like the internet connection here, in and out. Brandon Paul looks a lot like Kendall Gill, except for the mohawk. Illinois go into the half struggling a lot more than they ideally should be. it is, however, surprising that Boise State has quite as much athleticism as they do — that is not typically a WAC characteristic. They do, however show solid three point shooting — something that perennial WAC favorite Utah State is always good at. Wowsa, quick start to the half, a Mike Davis put-back and a McCamey 3 puts the Illini comfortably up nine — and I use the word comfortably for the first time tonight. Actually Illinois should really be winning this by a LOT! They won the rebounding battle for the first half, and committed 6 turnovers to BSU’s 13. I would like to see the Illini build some momentum from the Clemson win, btw how cool was that scoreboard show before the game? The highlight reel from the ACC Challenge, the greatest comeback in school history. Zach Morris back on the floor, teehee. “Hangin around, hangin around…this kid’s got alligator blood.” Teddy KGB’s quote about Mike McD in the legendary movie Rounders is apropos in this case, because the Broncos will not die. They will not go away. And from a defensive standpoint it looks like the Illini won’t clamp down enough to be able to do anything other than outscore them. I strongly disagree with that idea, but with the tremendous potential of DJ and Paul, I see where he’s coming from. Have I mentioned how much I heart Dominique Keller?? It helps that his name makes him sound like a girl…but I heart him much! Agreed. Hard to believe, but this odyssey, this double-dip, double-header, double-duty etc. of Illini sports concludes in 7 1/2 minutes, then postgame pressers, but it really was a blur wasn’t it? By the way that “House of ‘Paign” sound effect, the your guy just died in “Double Dragon” or “Streets of Rage” scream sound…as much as I hate it, it’s now growing on me. Like my cohort PB said…coming up on dagger time. You have to put inferior teams away at this point. And just when you thought Mike Tisdale had saved the game…Anthony Freaking Thomas, the A-Train…hits a driving layup to cut the lead to two. They are now in foul-or-die mode, though, and the Illini, typically a bad-shooting free throw team, aren’t half bad at it this year. Bill Cole fouls out, in limited playing time off the bench. He won’t be thinking about this game with pride 10 years down the road. And a 1 of 2 performance from the line for Boise State and then Tisdale hitting two bulges the lead to 82-77, and a probable Illini win. Check back for more after the post-game press conferences, with comments from Bruce Weber, the Illini and their opponents. The Illini were a little subdued after the game, with Mike Davis summing up the disappointment best. The Boise State defense was stout all game, holding the Illini to just 45 percent from the floor — a respectable percentage, for certain, but not when you consider that they shot 50% from behind the arc. Illinois head coach Bruce Weber wasn’t any happier after the game, as the players basically said that he was pretty angry in the locker room. Weber was also unhappy with his team’s inability to finish the game. Illini Win??!!?? Yes, You Read That Right! There’s no one anywhere who predicted an Illinois win Saturday against Michigan. I’m about the biggest Illinois apologist that there is, and even I was urging you to bet against the Illini, and to lay 7 points while doing it! After a short amount of time, however, the glow of a great victory has waned and left two very poignant questions to be asked. The first is whether this was a victory from an Illinois team finally playing up to expectations, or whether this victory can completely be attributed to the wheels falling off of this Michigan teams’ wagon. The more that I think about the game, the more I really believe the latter to be true. Michigan’s defense is starting to play ridiculously bad. It’s almost getting comical at just how bad they are playing. The Wolverines are doing whatever the opposite of peaking is, winning only one game in their last five, with that win being against FCS opponent Delaware State. With NCAA investigators descending upon Ann Arbor, RichRod looking dirtier than Rod Blagojevich and a best-case scenario of six wins (with games remaining against Purdue, Wisconsin and Ohio State, winning one would be an accomplishment), Michigan is definitely in disarray. Illinois just managed to take advantage of that. The second question is much more accusatory towards the Illini — Just where was this type of offensive production all season?? I understand that Michigan’s D isn’t that good, and that Illinois just managed to take advantage of it. But 55 rushes for 377 yards? Illinois didn’t even manage that production against Illinois State earlier this season, in their only other win. That type of production has little to do with the quality of your opponent — You’re just getting the job done up front and mangling a team when you get that many yards. And even if Michigan’s defense (along with coordinator Greg Robinson) is terrible, Illinois still was great on offense, just like everyone thought they would be all season long. So why now? Why, when they are 1-6, and 0-5 in the Big Ten, can Illinois suddenly move the football? Why is the offense NOW able to create some opportunities? Why did it take so long for this team to finally get motivated and put up the effort which we all knew they were capable of? Unfortunately, those are all questions that only Ron Zook has the answer to, and no doubt he’s not giving anyone the answers. And therein lies the ultimate problem. This team would have almost been better off playing horribly the rest of the season — this win only provides a ridiculous tease to an increasingly more disenchanted fan base. While they were certainly placated during the second half, and most likely after the game as well, soon all of their minds will turn to these questions, namely, just where was all this effort all season long? If Zook can’t figure out what worked this week, and how to consistently squeeze this type of effort out of his team, remarkably, the win may end up reflecting worse on him than any loss would have.